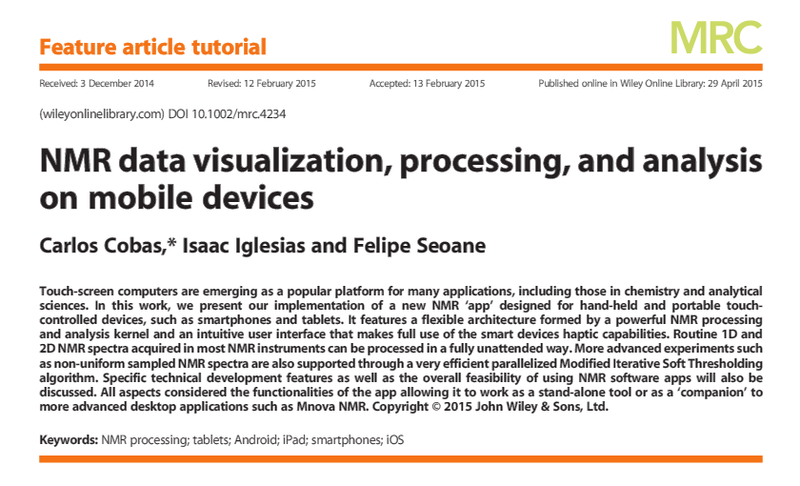 Carlos Cobas has written this article about NMR analysis on mobiles devices in collaboration with Isaac Iglesias and Felipe Seoane. Touch-screen computers are emerging as a popular platform for many applications, including those in chemistry and analytical sciences. In this work, we present our implementation of a new NMR ‘app’ designed for hand-held and portable touch-controlled devices, such as smartphones and tablets. It features a flexible architecture formed by a powerful NMR processing and analysis kernel and an intuitive user interface that makes full use of the smart devices haptic capabilities. Routine 1D and 2D NMR spectra acquired in most NMR instruments can be processed in a fully unattended way. More advanced experiments such as non-uniform sampled NMR spectra are also supported through a very efficient parallelized Modified Iterative Soft Thresholding algorithm. Specific technical development features as well as the overall feasibility of using NMR software apps will also be discussed. All aspects considered the functionalities of the app allowing it to work as a stand-alone tool or as a ‘companion’ to more advanced desktop applications such as Mnova NMR.